OMFG EVA IN MY MALAYSIA???? | FULL MOE PANIC!!! OMFG EVA IN MY MALAYSIA???? 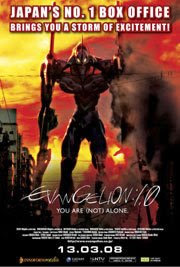 14-year-old boy Shinji arrives in Tokyo-3, a heavily fortified outpost that’s survived “Second Impact,” a calamity leaving humankind vulnerable to alien machines referred to as Angels. Last hope for survival rests with government agency NERV (whose motto reads, “God is in his heaven, all is right with the world”) and its gigantic Evangelion fighting artillery, a human-mechanical hybrid designed by Shinji’s distant father, Gendou. OMFG, after agonising for what seemed like an eternity, the wait has payed off!! Now, to organize a gathering of Malaysian Otakus to go and catch it together. This entry was posted in anime, EVA, Event. Bookmark the permalink. @fariz: indeed. it fills my heart with joy to see it coming to local shores. @faye: cineleisure Dmanasara the one that is connected to The Curve. Quick, need somebody (who wouldn’t mind) to organize a gathering for the screening ^^. OH YES~! A definite must watch ^^ Let’s definitely most definitely organize a definite outing.